Why Teams? Why Now?New Work. New Rules. Speed. Complexity. Disruption. These are the things companies need to deal with every day if they want to survive and grow. They have to innovate — and this requires a culture that fosters a new breed of hyper-collaborative teams. Studies confirm: People working in teams innovate faster, achieve better results and report higher job satisfaction. In fact, companies that promote collaboration in the workplace are five times more likely to be high performing and are more profitable. But teams are under pressure to move faster than ever. The highest-performing teams are different. Little about their work resembles what they did in the past. These new teams are constantly collaborating: Their days are filled with a never-ending exchange of information and ideas, working in rapid cycles of iteration. Their tasks are interdependent and their projects fluid. So how is this new kind of teamwork different from what we’ve always done? Think about the difference between a swim team and a basketball team. Swimmers stay in their own lane, but basketball players interact and transition constantly, relying on each other to win. Teams today need to do that too — navigate a fast-paced flow, bouncing between team members, iterating and improving on each other’s ideas. Everyone is accountable to keep work moving forward. Many teams today are adopting design thinking methodologies and agile behaviors to structure their work. By understanding their activities and behaviors, we can design spaces to help these teams work in new ways. A methodology for creative problem solving, this kind of work is physically and cognitively active. Teams are leading workshops, brainstorming, filling walls and whiteboards with content and coming together to share their ideas. Team members sit together so they can stay connected and work faster. They also need moments of retreat from the group to focus, absorb information and process their own ideas. People stand, sit, draw, gesture and move materials and objects. The work is dynamic and fast-paced. Agile is process-driven work derived from software development and now used by lots of industries to improve speed, flexibility and customer focus. Agile teams structure their work into a sequence of activities that guide them to execute quickly, monitor progress and re-adjust workflow. Their practice includes daily standup meetings, pair-based work, sprint reviews and sprint retrospectives. These teams constantly shift between modes of work, working alone and together as the task demands. To better understand their challenges, Steelcase recently studied teams in Europe, the Middle East and North America. 1. New Work. Old Office. 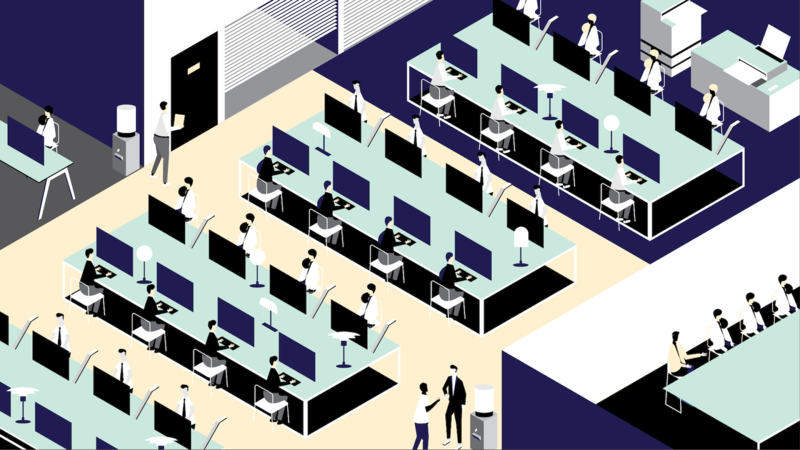 Most offices are still designed for linear work and don’t enable the workflow, activities and behaviors required for design thinking and agile methodologies. Teams need to work in close proximity with easy access to their information, but they often don’t have a “home” where they can do this. People feel a lack of control over their environment and struggle to balance their individual work with the demands of the team’s work. Most spaces are designed with fixed furniture and walls that can’t adapt easily or quickly to the changing activities people do throughout the day. 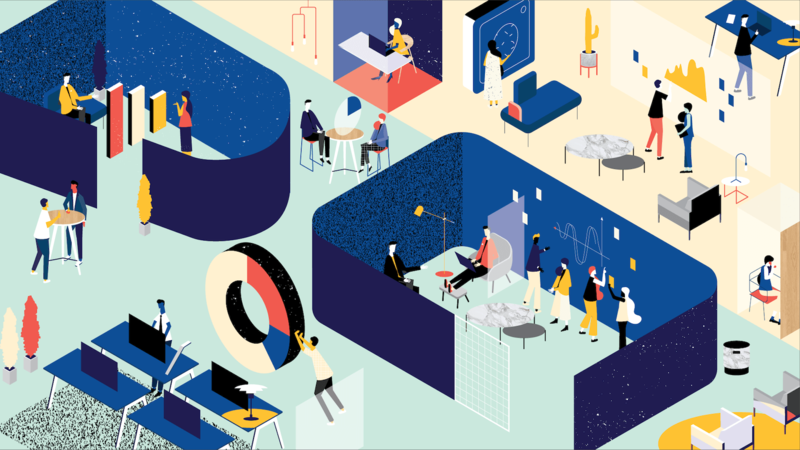 Solving big problems requires big ideas, but most collaborative spaces are designed for sharing information which means people tend to sit, listen and participate more passively. These spaces quietly discourage people from becoming physically and emotionally engaged in problem-solving activities. Most people have multiple personal devices but less access to technology for group work. When large-scale collaborative technology is available, the design of the space can become a barrier between people and the device, limiting their access and engagement with content on the screen. Today, most spaces are not designed to support the ebb and flow that happens with hyper-collaborative teams. Most spaces are planned around square footage per person and do not consider the needs of teams. The best workplaces support the activities of the team while nurturing the needs of individuals, thinking about the “Me within We.” Forget what your coach may have told you — there is an “I” in team. Giving people the ability to do the following will create a workplace that supports both. Read the full story about today’s hyper-collaborative teams.